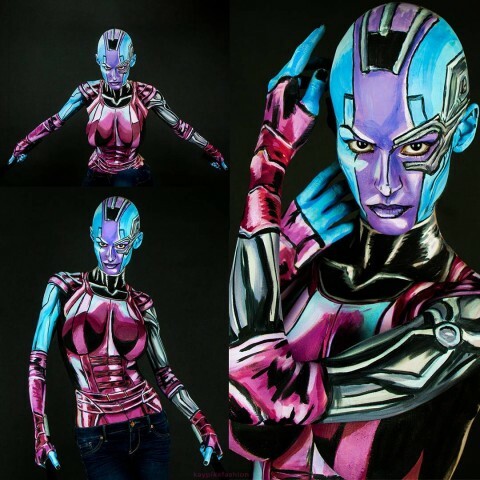 Nebula Cosplay Body Paint « Adafruit Industries – Makers, hackers, artists, designers and engineers! Professional designer, artist, and cosplayer Kay Pike keeps churning out impressive cosplay body paint work. She hashtags her work as cospaint, and the term definitely applies. We’ve recently featured her Attack on Titan paint and Captain Marvel. She’s really outdone herself with this Nebula cospaint. She used a bald cap and did a fantastic job of hiding the seams — I’m always impressed when cosplayers can do that — and the shading is beautiful. Kay applied the same robotic techniques she learned while painting Doctor Doom. Follow Kay on Instagram to keep up with all her latest work. She also has a Twitch account, and she occasionally demonstrates body painting there.